Yeah, I'm pretty strongly against the idea of him strictly being a direct counterdraft to crazies. My intent is to have a reference to his first big story arc where he fights the Madness, but not have it totally dominate the card. I haven't provided a bio, so I think that's kinda my fault. Rac Shade, an alien poet from the planet Meta, is recruited by Changemaster Wizor to become a Changing Man. Shade is deceived into traveling to Earth, causing his body on Meta to rot. As humans die when taken over by a Changing Man, Shade possesses Troy Grenzer, a serial killer about to be executed. Utilizing the Madness Vest (or M-Vest, as it's usually referred to), Shade can tap into the primal force of the Madness. The most direct comparison I can think of for his powers is someone like Genie from Aladdin. he can change his shape, create constructs that are indistinguishable from real world objects, transmute things, shoot energy, teleport, and do a weird soul-swap thing where he becomes another person/object in body and mind. However, he does not have too much control over these powers, and they will often act against his will, either at random times or based off his own subconscious. Shade's first mission on Earth is to fight the American Scream and stop the Madness from taking over Earth. He fights and helps many individuals infected by the American Scream's Madness across America, including a man who was become obsessed with the JFK assassination and a hippie revolutionary who has created a multi-layered commune reality. After defeating the Madness, Shade continues on adventures with his friends. He is killed a few times, but always reincarnates in different bodies; a red-haired woman, a black-haired madman, and more. That's a bit of wikipedia and a bit of my writing. If I wrote anything confusing, I can clarify. How many Insane, Unstable, and Troubled figures are there? Seems odd to base the design around countering such a small pool. I'd be afraid of making his usefulness too niche. I'd agree with that - not familiar with the character, but would it be at all thematic to MAKE a character Insane or Unstable for the rest of the game? Like, to make them go a little bit crazy? That's more the game of the American Scream, his big bad guy. I'm hoping I can design him too, cause that's a really fun concept. If I could get away with it, he'd even be able to drive DOs insane. Hmmm. Maybe a way to change their personality to something more normal, like Tranquil or Calmed. I like it, but I just feel like there isn't enough room on the card. You'd probably have to introduce markers and all that, and I just think the reality warping should take precedent with the character. His main moves, from my experience, are weird reality tricks, energy blasts/big fist constructs (functionally the same thing), making constructs, teleporting, and possessing new bodies when he dies. All the other things are things he can do, but I find he uses them less often. 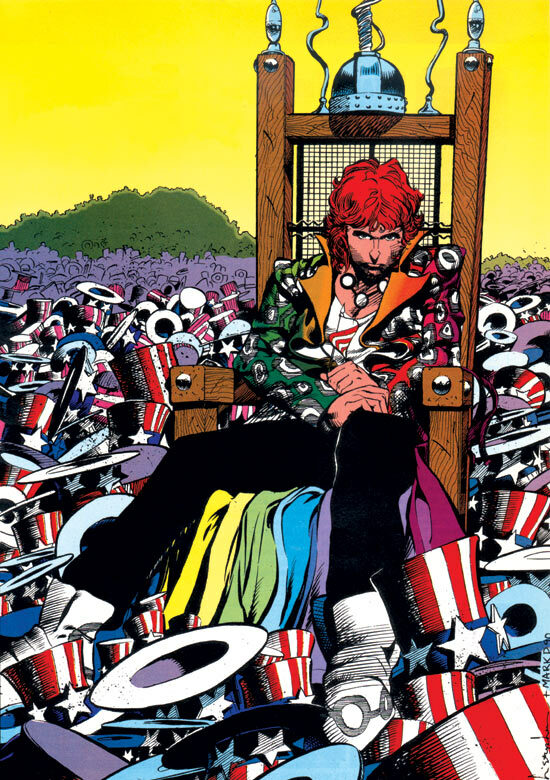 He also had a big focus on mental stuff in the first 18 issues, but that happened a lot less often after that. I'm trying to represent the blasts/fists with his normal attack, the reality warping with his M-Vest (with a slight addition for going up against 'crazy' figures), and the teleporting with Madness Stream. I left out the constructs because that's something that could take up the whole card. I also figure that if somebody was really intersted enough to make a card for "the time Shade made a giant fetus version of himself" or "the time Shade got drunk and accidentally created a killer Santa" they could make seperate cards for them, like the Lantern Constructs. It was really a toss-up between having him possess bodies and having him teleport, but I went with the teleportation because of the mini choice. Like I said, I'd like to see a Shade the Changing Girl pick up the possession concept, but I haven't read that comic yet, so I don't know if that would work. I'm still feeling the "single die" concept the most at the moment, but I'm still struggling with a direction. Thanks again everyone for hashing this out with me. -skull you roll, inflict a wound on a figure within 4 clear sight spaces of Shade. -shield you roll, roll 1 additional combat die. -blank you roll, remove an Order Marker from the card of a figure within 4 clear sight spaces of Shade. After rolling all dice, if you rolled more than 2 dice, inflict a wound on the figure you control closest to Shade. Okay, here's yet another stab at it. I also tried simplifying a bit. He can obviously overload far easier this way. Is this something you'd spend a whole turn on without Zatanna around? How do you feel about it when Zatanna is around and can help you get blanks? I could see a change from removing OMs to moving OMs like Karat has been suggesting as the next step in nerfing it, if needed. Okay with Zatanna out and Constantine in playtesting, I'd really like to take another stab at Shade. Here's where I left him last. At the end of the round, you may choose up to one figure you control adjacent to Shade and roll the 20-sided die. Place Shade on an empty space exactly X spaces away from his original placement, where X equals the number rolled, then place the chosen figure on an empty space adjacent to Shade. If a figure cannot be placed, destroy it. Figures moved with this special power will not take any leaving engagement attacks. I'm pretty happy with Madness Stream, so the M-Vest is what I'm really trying to perfect. I like that it isn't tied to attacking anymore, because Shade isn't really a combat heavy character to begin with. So the theme here is that Shade is the user of the Madness Vest, which allows him to tap into a wild destructive called the Madness to warp reality. The power of the Madness Vest is pretty up there. Shade can warp matter, create new lifelike constructs, shapeshift, teleport, shoot energy, transfer his soul into other objects, and do a whole bunch of weird tricks with souls/minds. When he's at his best, Shade has near god-like power; He was once able to ignore the fact he'd been killed for maybe a month just through sheer Madness power. Most of the time, he' not as his best though. Shade usually has pretty poor control of the M-Vest, because he's essentially trying to harness pure chaotic energy. On top of that, the Madness Vest works off of the mental state of the wearer, meaning emotional distress can cause it to backfire pretty badly. And Shade's the kind of sensitive guy that's almost always in emotional distress. So the M-Vest is pretty much never working exactly how he wants it to. He could randomly explode with energy, accidentally create constructs or warp reality based off whatever he's subconsciously thinking about at the time, spawn an evil split personality, bring back a ghost from the past, or just teleport to an entirely different location, depending on how screwed in the head he is at the time. It's something that's not just a threat to himself, but everybody around him. Another big limitation is that I don't think he can really physically heal things. He can't mend a bullet hole and he can't bring somebody back from the dead. Sometimes he can accidentally make a dead soul come back to the world, but it's made very clear that they're just a ghost and not resurrected. The Madness isn't the same thing as madness, but it is often drawn to the mentally disturbed, distraught, or unstable. Shade's job is usually to step in and handle these situations, so he does his best work when going up against people who might be a little touched. So that's what I'm kind of aiming for. A reality warper (with a special focus on mind/soul tricks and dealing with the Insane if possible) who doesn't really need to attack, with extremely strong powers that can get out of his hands and backfire really easily. Very high-risk/high-reward, and then hopefully Constantine and Zatanna can help you push it more towards the reward side. I was originally really digging the idea of representing his powers through switching your OMs with your opponent's OMs, but Arkham suggested it might not be the most useful mechanic. I agree with him, I'm just mentioning it because I think it was the closest I felt to capturing the thematic feel of the character, even if it wasn't mechanically viable. After Shade rolls attack or defense dice against an adjacent Unique Hero, if you rolled at least 1 blank, you may choose an Order Marker on that Unique Hero's card. Switch it with an Order Marker on this card. Both players may reveal these Order Markers normally on their turn instead of their other Order Marker of the same number. At the end of the round, all Order Markers moved by this special power return to the player who controlled the Order Markers before they were moved. I like this design a lot but there are a few things to consider with Madness Vest. The tying theme of JLD is blank manipulation, with a subtheme of D20 rolling. This design accomplished the D20 rolling in a cool way where I can roll once then choose to reroll with Constantine and think about which roll I want, rather than defaulting to the highest roll as with most powers. In terms of blanks, I'm wary of the options presented by Madness Vest. Removing an Order Marker per blank could result in regular double OM removal with Zatanna & Constantine support. I think it could be worthwhile to investigate the power level of swapping the shield and blank options. I'll report Deadman soon. With JLD hype, I'll make him my next LD. Yeah I absolutely want to revise Madness Vest, maybe even completely change the mechanics again. I've just had this guy in the back of my mind so I'm hoping posting him here again might give me some inspiration/new perspective. I'm really excited to see Deadman happen too. I almost made him my public design nomination this round. Looking back at it now, I think I would prefer to see an acrobatics power over another ghost power. Okay these are some new alternative versions of the M-Vest power. After rolling all dice, if you did not roll any skulls, inflict a wound on the figure you control closest to Shade. Shade adds 2 to his attack when attacking an Insane, Unstable, or Troubled figure. After Shade rolls attack or defense dice against an adjacent Unique Hero, if you rolled at least 1 blank, you may choose an Order Marker on that Unique Hero's card. Switch it with an Order Marker on any card that you or that player controls. Both players may reveal these Order Markers normally on their turn instead of their other Order Marker of the same number. At the end of the round, all Order Markers moved by this special power return to the player who controlled the Order Markers before they were moved. -a skull, inflict a wound on the chosen figure. -a shield, place that shield on the chosen figure's card. While that figure has at least one shield on their card, add 1 to that figure's defense. -a blank, place that blank on the chosen figure's card. While that figure has at least one blank on their card, add 1 to that figure's attack. Whenever Shade receives one or more wounds, remove all Combat Dice placed with Madness Vest. This last version is a slight bit of a stretch thematically, but it could lead to him being really useful and fun to play so I'd be okay with it. Deadman can move through all figures and obstacles such as ruins, and is never attacked when leaving an engagement. Deadman cannot be targeted by opponents' non-adjacent figures for any attacks or for any opponents' special powers that require clear sight. After revealing an Order Marker on this card and instead of moving, you may choose a Unique Hero adjacent to Deadman and roll the 20-sided die. If you roll 13 or higher, place Deadman on that Unique Hero's card. You control that Unique Hero while Deadman is on its card. After revealing an Order Marker on this card, instead of taking a turn with Deadman, you may take a turn with that figure. At the end of the round or when the chosen figure is destroyed while Deadman is on its card, place Deadman on a space adjacent to the space currently or previously occupied by that figure. After a figure you control with Deadman on its card rolls attack or defense dice, you may move that figure 1 space for each blank rolled. Figures moved with Spectral Acrobatics will not take any leaving engagement attacks. Here's the current version of Deadman, coming up next for me. The last line of the possession power should specify unoccupied space (and the previously occupied part is a little confusing, though I get the intention that "previously occupied" only refers to if the figure is destroyed. I could see rules lawyers also interpreting that as somewhere that the figure moved that turn though, so maybe there's another way to approach the wording?). I like the power set. Is it clear for the possession power that when it's an opponent's figure you've completely taken control of the possessed figure from the original player? Wording definitely needs a lot of polishing here. The intent is for Deadman's owner to fully control the opposing figure, therefore allowing Zatanna (II)'s ability to change a die of a then-friendly figure to a blank for the purposes of Possessed Acrobatics.